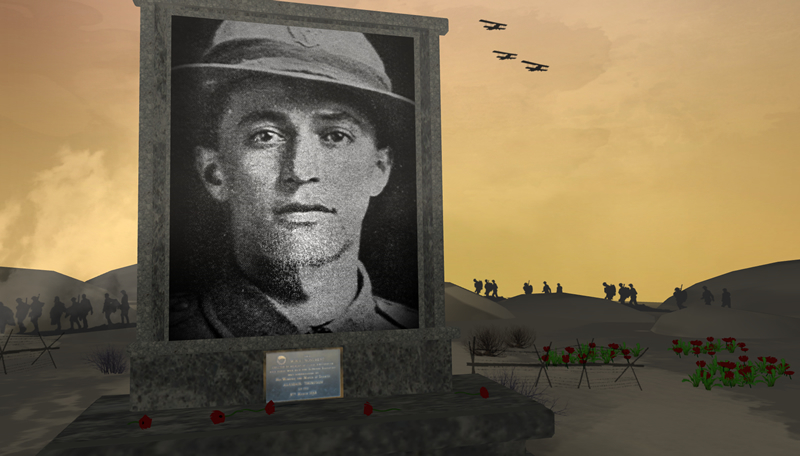 The video for this story about First World War soldier Hāmi Grace screened on TV3 News on 18 April 2015. An old boy of Wellington College, Thomas (Hāmi) Marshall Percy Grace of Ngāti Tūwharetoa was a talented sportsman. He played rugby for the New Zealand Māori teams that toured New Zealand in 1911 and Australia in 1913. He was also a talented cricketer, playing first-class cricket for Wellington. When war was declared in early August 1914 the 24-year old Grace was working as a clerk in the head office of the Post and Telegraph Department in Wellington. While most Māori servicemen enlisted in the Maori Contingent (later the Pioneer Battalion), Grace enlisted in the Wellington Regiment. He sailed with the Main Body two months later and landed at Anzac Cove with the Wellington Battalion in late April 1915. Grace’s snipers, posted throughout the valley, placed a barrier as impenetrable as any earthwork between the traffic in Monash Valley and the Turks whose trenches overlooked it. Thenceforward, provided the snipers were first warned, even a convoy of mules could go to the supply depot near the head of the gully at midday without a shot being fired at it. Grace and Malone, his commanding officer, were both killed on Chunuk Bair on 8 August 1915.